For those of us who are old enough to remember when the Beatles were still together, it’s hard to believe that Ringo Starr is almost 80 years old! The legendary drummer celebrated his 77th birthday in Hollywood on July 7th in typical Ringo style. He surrounded himself with like-minded individuals, signaling to the world that we should all be thinking more about how to care for each other than how to fight with each other. Starr and attendees at the event participated in a “peace and love chant” that included guitarist Joe Walsh and “Twin Peaks” director David Lynch. 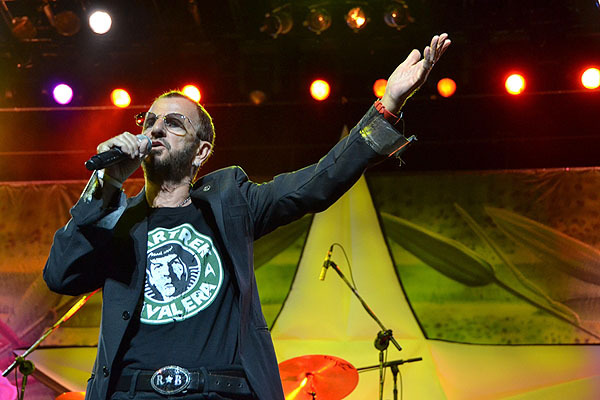 Walsh has been an on-again-off-again member of Ringo’s All-Starr Band since its inception in 1989. “There is a lot of trouble in the world, a lot of violence in the world and a lot of starvation and a lot of people without water,” Starr said. “I’m a big supporter of Water Aid because everyone should at least have water … It’s not all bombs and guns.” Water Aid is a U.K.-based organization that was established in 1981 to promote safe water availability for poor communities around the world. Starr also took the opportunity to talk a little but about his soon-to-be-released album, Give More Love, which is coming along in September. Starr revealed that his former Beatle band mate Paul McCartney is among the musicians who contributed to the effort and is featured on two tracks. McCartney is still “one of my mates,” according to Starr, and complimented his bass-playing ability by calling him “the most melodic bass-player in the world.” Getting the two together to work on an album may not have been the easiest thing in the world to do as both ex-Beatles are quite busy with their own musical endeavors these days, including significant time spent on the road. Despite potential scheduling difficulties Starr’s request for McCartney to work on a couple of tracks was obviously good enough for his old friend. It’s encouraging on many levels to see that Ringo Starr and Paul McCartney are both still out getting it done despite the fact they they are both well into their seventies. They are an inspiration to both fellow musicians and fans all around the world.